The development of plastic polymers really took off after the 1950’s when advancements in the industry meant that all sorts of consumer products could be made more durable and less expensively. Unfortunately, like many wonder products developed over the ages, the technology was pushed to its extreme over time, to be more economical and to reach a larger market, and this had its side-effects. The result was that plastic packaging and products were value-engineered to the point that they could no longer be recycled or reused. Think of the plastic shopping bags that shops used to give away for free, that lasted just long enough to get your groceries home, and often littered roadsides. Another aspect of plastic products that we have slowly begun to understand is that they can hold serious health impacts for us by leaching chemicals into our water and even ending up in our seafood. Today, we have many millions of tons of plastic sitting in landfill and washed into rivers and oceans. And, thanks to its durability, it will only break down very, very slowly. In 2003, the South African government enacted a new law that put a price on shopping bags to effect a change in consumer behaviour. We can be proud that South Africa was one of the first countries to do this, and the effect was marked – people kept and reused their bags and now there is a market for reusable, non-disposable bags. 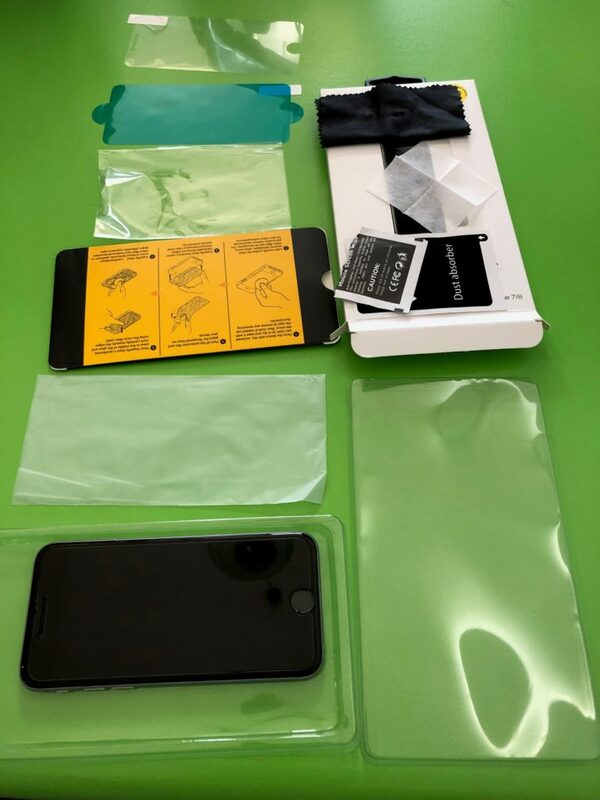 Even Something like a simple screen protector comes in more plastic than you might imagine. As any economist will tell you, a manufacturer or supplier will not produce something for which there is no market. The truth is that shops and manufacturers will continue to sell us plastic products and packaging unless we, as consumers, demand something different. After reading “Zero Waste Home” by Bea Johnson, I started doing a bit more research. I found many online resources on how to avoid disposable plastics, where to buy non-plastic reusable containers, and where to shop to find plastic-free products. Unfortunately, many of these resources were not available in South Africa and importing these things from overseas does not make sense when you are trying to reduce your carbon footprint. I also found out just how many items have plastic in them – clothing and fabrics, detergents, toothpaste, cosmetics, machine parts that used to be made of metal, the myriad containers we use, and even tea bags! However, with the afore-mentioned media attention, there are now a few places that have started suppling alternative products locally – from local restaurants that use plastic free straws and cardboard take-away containers, to online retailers like Faithful to Nature, which allows you to use a search filter to only find plastic-free items. 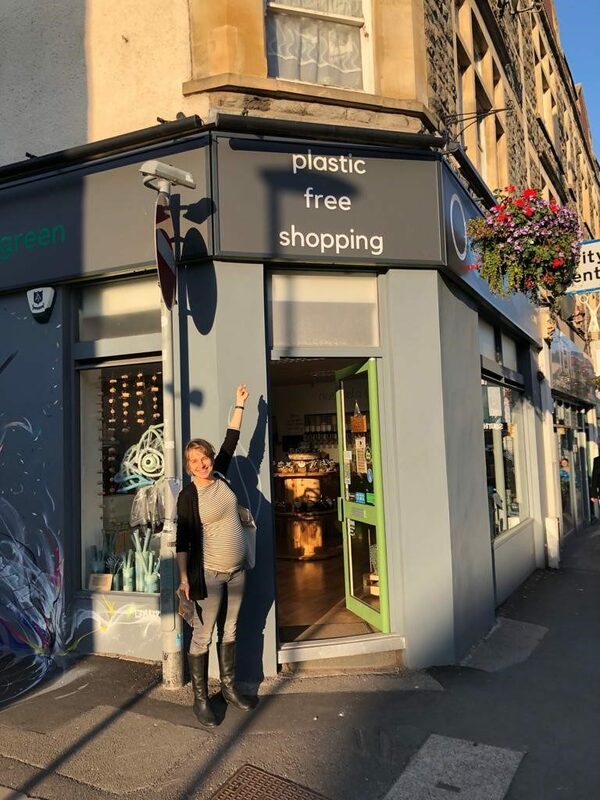 My colleague, Zendre, found some Plastic Free Shops in the UK. I decided to try the challenge of going plastic-free for a month. This turned out to be trickier than I had imagined, as I had already cut my consumption of plastic things down quite significantly. I’m vegan, and I stocked up on a lot of my staples from Faithful to Nature, packaged in cardboard containers instead of plastic bags. Some use plastic-like bags made from plant fibres that are completely biodegradable; other items came from Food Lovers Market – one of the few places that still sells fruit and vegetables loose. I had my fabric organic cotton shopping bags and glass containers for buying dry bulk items, such as lentils and nuts. I had to pack my lunches at home in glass containers because most takeaways don’t have plastic free packaging. Even cardboard takeaway boxes often use plastic-coated cardboard. I had to find alternatives for the things I always used to buy in plastic. This was mostly successful, and the things I couldn’t find I just had to go without. I now buy loose leaf tea and use a tea strainer. All my produce is now bought loose or comes in carboard containers, and I use glass containers for everything else. I tried looking for stainless steel containers, but I didn’t find any locally that I felt would last. 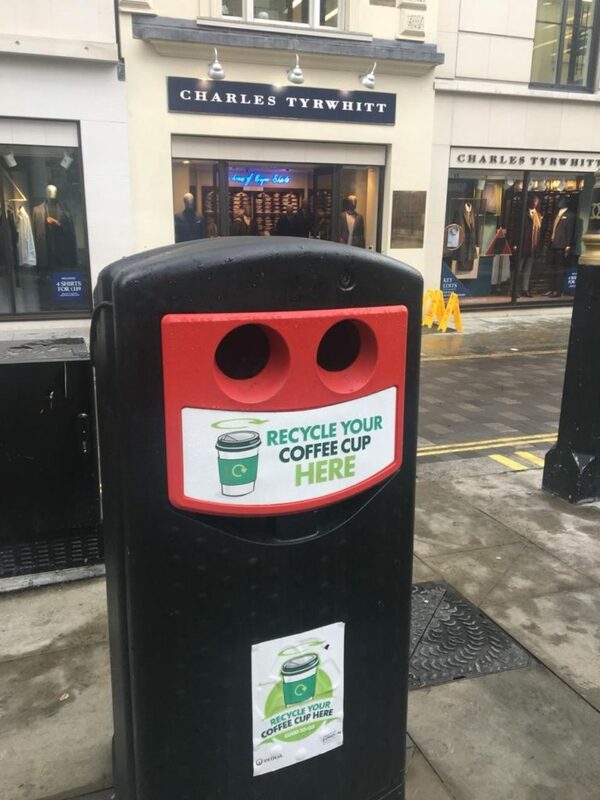 Street-side coffee cup recycling bin. In the bathroom I have a bamboo toothbrush; toothpaste in a glass container; soap that comes wrapped in paper; bamboo fabric towels; and I use an old school safety razor and soap instead of the more expensive disposable blade razors with shaving foam in a can. My deodorant is a crystal stone that did come in plastic, but at least it can be recycled; and the toilet paper is made from sugarcane waste in paper packaging. My insect repellent comes in a glass bottle that can be refilled but, unfortunately, the spray mechanism is still plastic. I did not buy any electronics or consumer items, and I only bought music and books or rented movies digitally. That was not really a change, but it shows how some technology has made going waste-free easier. If I do ever want to buy something electronic, I don’t see how to get away from plastic at this point as it is in everything. I guess the best bet is to aim for recyclable plastic and plastic-free packaging. At the end of the month I have a new appreciation for how much plastic is around us and the fact that there are alternatives too – but you need to search for them. I have found many products that are not only less harmful than the old ones but actually work better and will last much longer (my new safety razor, for instance). As a disclaimer, I must say that I didn’t just throw all my old stuff out and buy new plastic-free stuff. For example, the pen I use is plastic and I will use this until it is finished, recycle it and then buy something better like a fountain pen that can be filled from an ink bottle. Will I stay plastic free? I would like to try as much as possible, but I will have to pick my battles as some things just don’t come plastic free… yet. I think we all need to be aware that, with every purchase, we are voting for something. If we, as consumers, start asking for and buying durable plastic-free products and products in plastic-free packaging, then manufacturers will follow our lead in order to meet demand. We cannot pretend to be ignorant anymore about what effect the choices we make have on the environment… and that means that we need to make informed choices.